Artist Ofri Cnaani has created a new photography exhibition consisting of prints and a performance piece at Andrea Meislin Gallery. Photographies on display echo ideas deriving from Xerox art of the 1960s simultaneously connecting with the visual world of the mesmerizing early photography of the 20th century. The exhibition ‘Wrong Tools’ will be on display until October 24, performances taking place on Wednesdays, Fridays and Saturdays. Cnaani’s Blue Print photographs are like intuitive maps constructed of performative ideas that associate with artist’s own body. With both of her performance and photographs, she creates a presence. The works are building up from fragments, and the pieces are put together in a compelling logic. These could be like ruptures built on the Internet surface, where constant image flows create new associations. Here is Ofri’s interview. 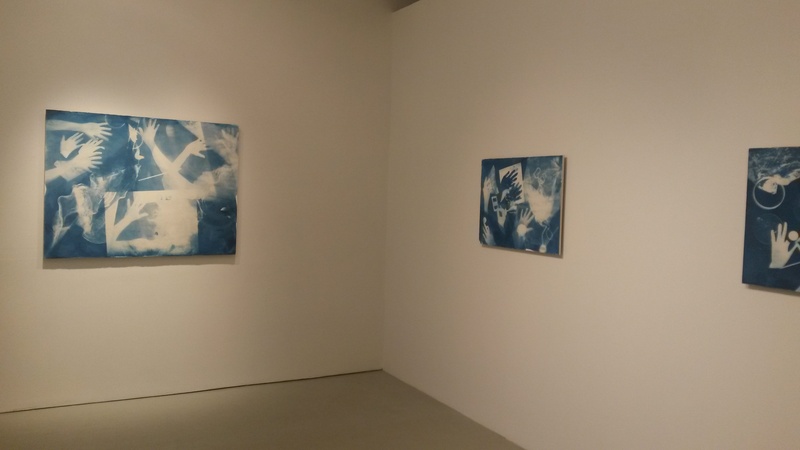 Firstindigo&Lifestyle: Your ongoing solo exhibition ‘Wrong Tools’, at the Andrea Meislin gallery speaks a strong esthetic and spatial approach with performance element added to the photography gallery. The performative element also looks back from the blueprints, which display hands in various positions doing tasks, perhaps. Are these prints your hands making the past performances, or projects? 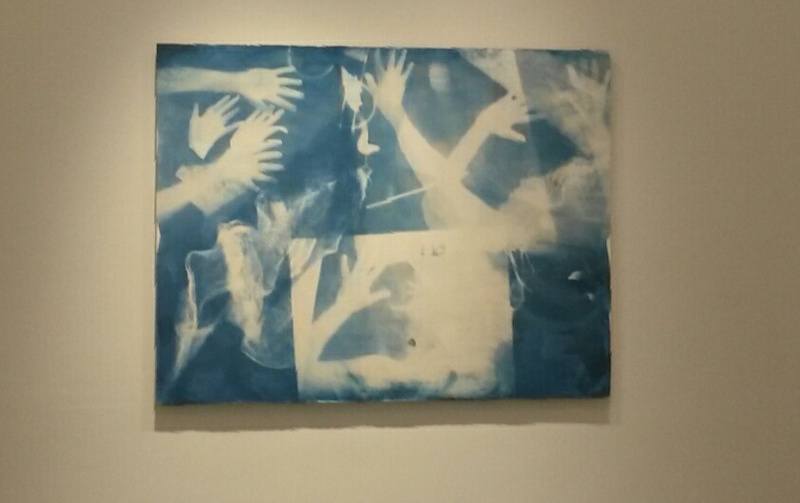 Ofri Cnaani: In the cyanotypes I’m using my own body. I’m using the special qualities of one of the earliest photo techniques to promote some sort of performative photography. In a way, it is very similar to what I do in the performance: I’m creating an image in a limited amount of time that is constructed from found objects, made objects and my own body. Like in the personalized ‘image maps’ I’m creating in the performance, here too, I have a limited control of the final result. The process is always between failure and magic. In your actual performance that I observed taking place during the opening night at the gallery’s foyer with windows, you encounter audience member on a participatory table setting, where each unique guest sits opposites of you. The scene comes out as very intimate and poetic; we are simultaneously looking at the wall where the reflection of the table surface is displayed with your real-time construction of objects and images on it. And, we are grasping the exchange between you and the other person embodying the performance. Quite interesting, a guest was taking pictures with her phone of the very situation as well. What is taking place in these moments? How do the photographs and the recording of the event resonate in the doing of the performance physically? OC: When someone sits with me, I first offer him or her a ‘reading’ of his or her visible future. I used a tarot-like deck that I designed titled ‘future business’. I also ask them to give me one personal item and to choose two items from my collection of small objects. I’m using the message on card they chose and the three objects they selected and gave me as a starting point, to create a live collage-like image. I called it ‘image map’. This image is captured and printed using a special apparatus I build for the show. Lastly I stamped it with a ‘Copy’ stamp and signed it with red ink, handing the Original Copy to my visitor. As the title ‘Wrong Tools’ already implies so many interesting visual connotations, could you tell more what is the idea or meaning behind it, is it metaphoric with a larger idea and also coming to the performance? Does it resonate solely with ideas, which derive from computing? OC: My husband, who is great in building things, always says everything is very easy if only one is using the right tools. I realized I’m always using the wrong tools. My studio is a mess and I’m always using the tools that are wrong for the job. I like to think about my method, using the collections of two and three-dimensional objects in my performance, as ‘endless metabolism’. I’m using the same little objects for different performances, as well as for the cyanotypes and other photos. The same objects travel between many of my projects, always been used in different ways, but never used as they were originally meant to be used. 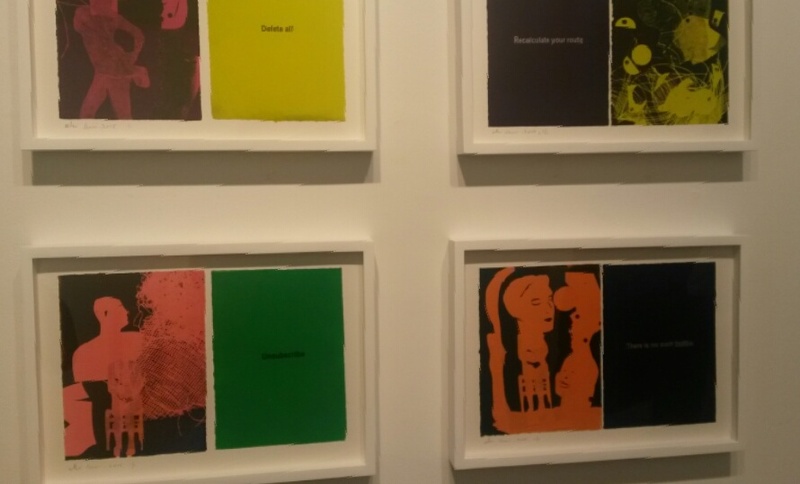 Then, your exhibition at the gallery has these colorful images called ‘future business’, that have a short message embedded in them. It seems that they relate to the performance, do they have an element of time in them as well? OC: The monoprints are also ‘one of a kind’ and were made in a similar way. I’ve been using cut-outs and flat objects, placed them on paper and rolled them under the press, so each one is a different arrangement, although some of the cut-outs appear more than once. The texts are the same texts on the special edition tarot deck I produced and then use in my performance. On each card there is a message we get regularly as an online user like ‘Delete All’ ‘Unsubscribe’ or ‘Change Your Profile’. These lines are charged with a very different meaning when we receive them as messages in a one-on-one ‘reading’ session where we all are so vulnerable. Adi Puterman curated your exhibition for Andrea Meislin Gallery, what do you wish to tell about the curating exchange and process, do you know each others tactics well? OC: Adi and I worked on the show for over a year and she was very involved with each step: from the concept of having an on-going 6 weeks performance in the gallery, to the selection of the pieces, and communicating my ideas in a written text. I have noticed that your artist career includes plenty of performance works, such as the ‘Seven Words’ at the Metropolitan Museum. This past work is also very interdisciplinary. Is a question of the different art forms relevant to you in your own art making, or are all forms closely related? OC: I’m driven by concepts and often by time constraints (like a different space I’m working in or a different collection or archive I’m using). I’m less driven by a specific medium or style. As an educator of the arts, how do you teach time-based process to your students, do you have guidelines for that? OC: We see many projects and discuss them, we read texts and using mind-mapping method in order to understand them and connect them to other ideas, texts and art works. I often think that New York city is such a creative hub with so much international potential gathered in one place. Do you consider that as an international artist based in the city you have a specific role or identity, which is perhaps one here, and another that goes back home in Israel communicating and identifying with the contemporary art scene there? OC: I’m not sure what do you mean by that but once you leave the place you were born and raised, your identity is always ‘more than one’ and in a constant negotiation. You have created public artwork, do these works imply a different kind of activism or sensibility that comes with the public space, or are all ideas you are doing basically interrelated? OC: My work is context specific. When I work in the public realm I work not only with a specific building and its specific history. The process always involves a community or a group of individuals. The process in those projects is part of the final piece. The final images are never known when I start working on a public piece. Can you tell a little what are your next steps going to be like? OC: Next week I’ll be doing a performance that is similar to the one in the gallery at Dallas Aurora. My project is part of ‘Altered States’ exhibition, curated by Julia Kaganskiy. Next month I’m going to Inhotim in Brazil to work with the park employees to create a participatory performance titled ‘Frequently Asked’ that will be then presented in Inhotim on early December.